Where is it? 125km north-east of Hobart, Tas. Treat yourself to some real travel eye-candy by visiting one of the top ten beaches in the world, as voted by the UK’s Condé Nast Traveller magazine – and the fourth best travel experience in Australia, as voted by us! There are two great vantage points that offer that emblematic bird’s-eye view of Wineglass Bay’s perfect curve of white sand, pink granite rocky shores and turquoise waters: the Mount Amos and Coles Bay lookouts in Freycinet National Park. Even the most amateur of photographers couldn’t take a bad pic here. But nothing compares to actually getting down on that pure white sand. Another great way to experience the region is on the Wineglass to Wine Glass full-day guided walking tour, where a maximum of eight hikers are given a commentary on the flora, fauna and history of the region while immersing themselves fully in this extraordinary Australian bush landscape. After walking through national park and putting your footsteps in the sand of this iconic Tasmanian beach, you end up at a banquet table on Hazards Beach, nursing a glass of the region’s cool-climate wine. Come at the beach from another angle by taking a dolphin-watching cruise. 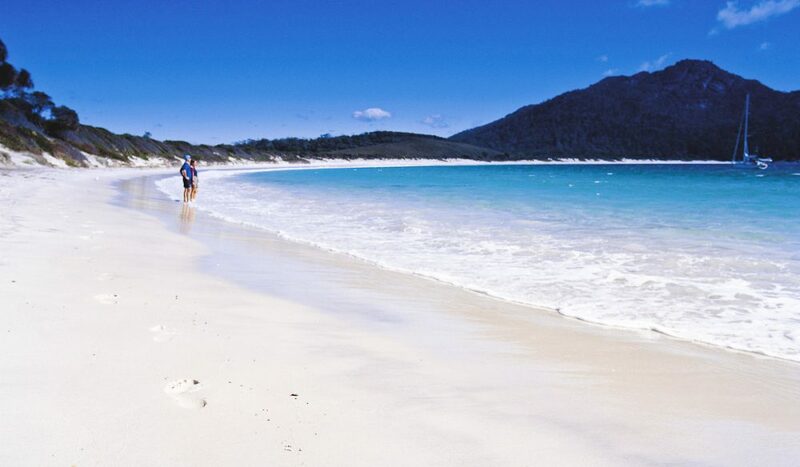 But no matter which angle you tackle it from, Wineglass Bay is a winner.